William Kentridge is a filmmaker, draughtsman, and sculptor, and the son of Sydney Kentridge, one of South Africa”s foremost anti-apartheid lawyers. In his drawings and animations, William Kentridge articulates the concerns of post-Apartheid South Africa with unparalleled nuance and lyricism. In the inventive process by which he created his best-known works, Kentridge draws and erases with charcoal, recording his compositions at each state. He attracted international attention when his work was seen in Documenta X and at the Johannesburg and Havana Biennials, all in 1997. His prints and drawings–and his drawing-based work in film, theater, and opera productions–present a unique, emblematic view of the state of South Africa today, from the Truth and Reconciliation Commission hearings to traces of apartheid’s violence in the landscape around Johannesburg.His work was further inspired by artistic satirists, including Honoré Daumier, Francisco de Goya, and William Hogarth. From 1989 to 1996 Kentridge made an important cycle of films that allegorize South Africa’s political upheavals through the lives of three characters: a greedy property developer, his neglected wife and her poet lover. The eight-minute animation Johannesburg, 2nd Greatest City after Paris (1989), which began the series, consists of two dozen scenes developed through minute changes to various drawings. William Kentridge was born in 1955 in Johannesburg. Son of two anti-apartheid lawyers, he learned at an early age to question structural impositions. In 1976, he attained a degree in Politics and African Studies at the University of the Witwatersrand after which he studied art at the Johannesburg Art Foundation until 1978. There, he met Dumile Feni and was greatly influenced by his drawings. He also worked as a set designer for film productions and taught design printing until he moved to Paris in 1981 to study drama at the École Jacques LeCoq. 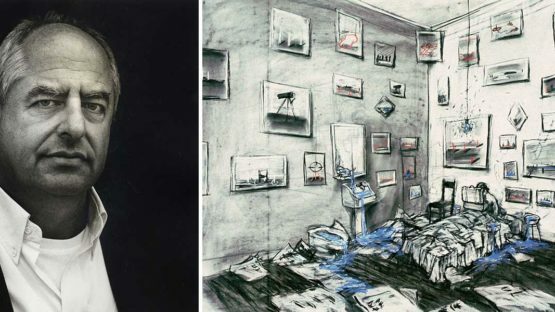 Since the 1980’s, Kentridge has been awarded various prizes, such as the Kaiserring Prize, the Carnegie Prize, the Standard Bank Young Artist Award, and the Red Ribbon Award for Short Fiction. He currently lives and works in Johannesburg, South Africa.